We're approaching Devil May Cry's North American ten-year birthday, and Capcom might be bringing a gift. Though Capcom has as of yet made no formal announcement, the ESRB's website has recently updated its listings for the first three Devil May Cry games to include the 360 and PS3, leading some to believe that the games will soon be ported into HD and re-released. 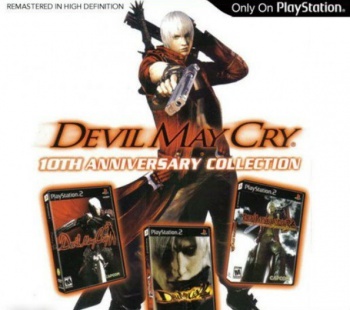 This comes a few months after a Spanish retail chain accidentally listed a Devil May Cry: 10th Anniversary Edition for release on November 30, which seems to match up with the ESRB listings. As the evidence piles up, Capcom staunchly refuses to acknowledge any of it, saying "We haven't made any announcements regarding a Devil May Cry collection." Of course, one glaring inconsistency is the big "Only on Playstation" hovering in the top right corner of the supposedly leaked image. That doesn't mesh well with the ESRB listing it for the 360, so perhaps the leaked image is fake. Or perhaps Capcom decided bring the game to 360 in the four months since the image came out; we can't really know. Until Capcom is ready to let the cat out of the bag, we'll just have to keep guessing at things like release date and price.